Sani Sticks Review: How Much And Where Is It Found? What is a Sani Stick? The answer is simple. Sani Sticks are sanitation sticks that have the purpose of cleaning and sanitizing your drains. If you’ve never heard of Sani Sticks, then you probably haven’t seen the TV infomercial that discusses the way that they work to keep the drains free and clear. They supposedly biodegrade, making them safe for the environment. They’re also supposed to be safe for all types of plumbing from septic tanks to conventional pluming. They claim that they not only clean your drain, but they also will keep your drains odor free. Sani Sticks are also reportedly safe for drains as well as septic tanks. You’ll love that they can last up to a month as well as keeping greasy build-up down to a minimum as it breaks down all things organic. How Much and Where is it Found? How Do You Use the Stick? How Do You Know You’re Making the Right Choice? The commercial is pretty easy to watch and understand. The product itself is not difficult to work with either. Here’s a brief transcript of parts of the commercial so you get an idea of what you’d be watching. ​​​​​​​​​Oh, no, your shower drain is clogged! Your bathroom pipe is plugged, and the odor coming from the sink is embarrassing. Stop drain clogs and stinky sinks with Sani Sticks, the concentrated drain cleaning and sanitation sticks that you drop in the drain once a month to stop backups, clogs, and nasty odors. Look, Sani Sticks fall and rest in the pip drain trap. As water passes through the pipe, the Sani Stick releases a super concentrated blend of powerful enzymes that naturally surround and break down food, grease, hair, and other organic materials, keeping water flowing and our pipes clean and odor free. Drop in a Sani Stick once a month to help repel greasy buildup that can clog drains. Drop in a Sani Stick once a month in the kitchen sink, bathroom sinks, utility room sink, bathtub drains, mop sinks, and anthwhere you want to keep water flowing without plugged pipes and embarrassing odors. Sani Sticks are all natural biodegradeable, and 100% certified safe for plumbing, septic tanks, and the environment. Stop wading in backed-up shower water, plunging and pushing clogged sinks, or paying for professional plumbing repairs. Order Sani Sticks right now to keep drains flowing strong and smelling fresh all year long. The commercial goes on to tell you how much it costs and what you can expect. It also tells you that all you need to do is use the Sani Stick to keep your drains smelling fresh and clog-free. Of course, keep in mind that the entire commercial has actors the entire way through, so it is going to be presented in a way that is supposed to entice their audience. We’ll get to the reviews from real people further down, but for now, let’s talk about where you can find it if you want to try it without making any significant financial investment first. You can find them at the official Sani Stick website. You can also find them at Walmart or Target, as well as on Amazon. Keep in mind that if you order them directly from the website, you’re probably going to be paying more in shipping and handling than what you might expect. In fact, it may be more than you actually pay for the product itself. You can find them for less at stores or online, but you might want to shop around to find the best deal for the product. Your best bet, especially if you just want to try them out to see if you like them, will be to purchase the Sani Sticks from some place local. Sani Sticks are pretty simple in their idea. You’re supposed to drop one of the inserts in your drain on a monthly basis. The insert then breaks down over time, and while it does, it also absorbs organic wastes and grease. In theory, by using the Sani Stick, your drain should stay clear and not hold on to any odors. The easy answer is that you push a Sani Stick into the drain until you can’t push it in anymore. Don’t forget to remove the sink stopper if you have one so you can get the stick in all the way. Depending on how bad your drain looks or smells is going to determine how long it takes for the sticks to take effect. Honestly, it can take anywhere from a few hours to possibly up to a few days to lessen the smells coming from your sink. Sani Sticks reduce and completely eliminate those mystery smells that come from your drain sometimes. Don’t be embarrassed – we’ve all been there. As they break down and absorb odors, they cause those smells to go away. You can expect a single stick to last for around a month. 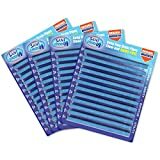 If you check out reviews on places like Amazon, you’ll find that lots of people agree that the sticks work really well with getting rid of odors, so if you have a smell that you just can’t get rid of, then you should really consider trying them. In fact, there are over 1800 reviews on Amazon with a total of 41% of people giving the Sani Sticks 5 star ratings. That has to mean something, right? But how about clogs? When it comes to clearing your sinks, Sani Sticks don’t quite measure up to the hype. The reason makes sense, though, because although it does have the right enzymes to break down some organic matter, it doesn’t mean that it will break down all clogs. Keep in mind that even Consumer Reports agrees that enzymes are great for clearing clogs, but it’s important to remember that if the clog is due to mineral deposits, the Sani Stick will not work. It also likely won’t work if the clog is severe. At the same time, Sani Sticks seem to be a great preventative measure in keeping clogs at bay, so that is something to consider if you’re interested in using them. Enzymes speed up processes like metabolism and other processes. In the case of Sani Sticks, the enzymes are supposed to break down substances at a molecular level. In fact, many different drain cleaners also use enzymatic cleaners as part of their drain clearing formulas. Sounds good, right? Enzymatic cleaners like the Sani Sticks are highly sought after because they are derived from more natural sources which supposedly makes them safe and also inexpensive. Are They Easy to Insert? Sani Sticks are supposed to be user-friendly by dropping one into the drain once a month. That sounds pretty simple, right? This depends on who you ask and what kind of drain they have. If your drain has a small opening, then you may have some level of difficulty putting the Sani Stick inside. Your best bet is to see if something like a fuzzy pipe cleaner would fit through the drain hole. If it would, then you’re golden. If it doesn’t, then a Sani Stick probably wouldn’t fit very well if at all. Some users have found that running hot water through the drain helps to get the stick through the drain if it looks like it will be a tight fit. Although they are easy to use, it is widely agreed as well that all-natural cleaners don’t typically work as well as more chemical counterparts. Due to the design of the Sani Sticks, they’re also not likely to pass through pipes easily, which means that they could very well cause problems later on. ​​​​Although enzymatic cleaners are cost effective, that doesn’t make them effective in getting rid of your drain problem. If you have a severely clogged drain, you’re going to be better off going with more conventional formulas like those that go by the names of Liquid Plumr, Draino, as well as other top brands. When it comes to preventing odors, there are quite a few things you can do before going for Sani Sticks. As some examples, you can use coffee grounds, vinegar ice cubes, or even doing something as simple as running hot water down the drain. Let’s face it – if you’re seeking a good customer experience, you’ll probably get that from Amazon, but from other places, it’s hard to say. For those of you that try the Sani Sticks, if you order directly from their website, don’t be entirely surprised if you can’t get through to someone as that appears to be a common complaint. While Amazon boasts plenty of positive reviews, there are plenty of negative reviews over on HighYa, too. One of the most common complaints just happens to be difficulty with customer service. For as many positive reviews that there are on Amazon, there are plenty of bad reviews, too. There are many complaints about the way that the Sani Sticks don’t dissolve. Instead, they say that they turn into squishy sticks that just sit there. Then again, it also depends on how frequently the sticks were put into the drain or even the possibility of user error. There are also claims that the users ended up with clogged drains instead of odorless drains. In fact, there are some pretty bad reviews that might make you think twice about putting one of these inserts down your drain. Here are some examples of some of the more negative reviews out there. In one example, a customer believes that Sani Sticks are no better than using baking soda and vinegar. He seems to feel as though that method was more effective than the Sani Sticks. 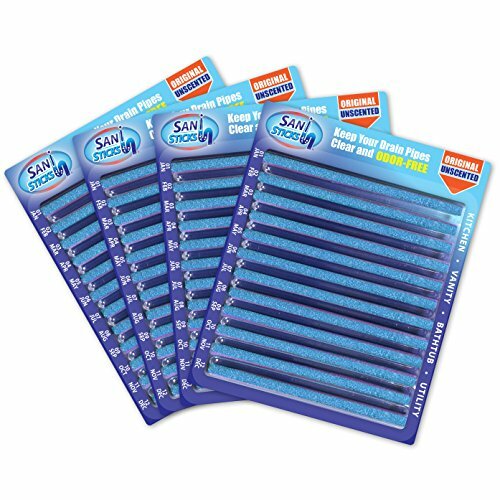 Sani Sticks are perfect for getting rid of pesky odors that waft from your sinks or tubs. It doesn’t do quite so well when it comes to releasing clogs, but works as an excellent preventative depending on who you ask. Should you choose to go for the Sani Sticks, you’re doing it at your own risk. Best of luck to you! What is a Sani Stick? The answer is simple. Sani Sticks are sanitation sticks that have the purpose of cleaning and sanitizing your drains. Also ,They supposedly biodegrade, making them safe for the environment. They’re also supposed to be safe for all types of plumbing from septic tanks to conventional pluming.